Just as the state of New Jersey is recognized as the nation’s principal pharmaceutical hub, Rutgers Business School (RBS) has evolved as an academic leader in pharmaceutical management training and research. Today, RBS has taken its pioneering role to the next level through the Blanche and Irwin Lerner Center for the Study of Pharmaceutical Management Issues. The Center was established in the Fall of 2004 with a generous gift from the Lerners. The Center strives to position itself as a leading institution of innovative ideas and activities for the growth of the biopharmaceutical industry. The Lerner Center focuses on encouraging research in the areas of managing biopharmaceutical research, development, and commercialization with the goal of increasing productivity, as well as discerning the impact of government policies and programs on competition, pricing and reimbursement, and access to biopharmaceutical products, medical devices and diagnostic products. The vision of the Center is to establish itself as a reliable source of information and views on critical economic, regulatory and strategic issues confronting the biopharmaceutical industry and indeed the healthcare industry at large viewed through a global prism. Facilitate exchange of management and research ideas among biopharmaceutical industry professionals and academia through seminars, symposia, workshops, and collaborative and joint research projects. Support faculty and Ph.D. students in their research and teaching involving economic, managerial and strategic issues confronting the biopharmaceutical industry. Provide executive education programs to help develop the next generation of business leaders in the biopharmaceutical industry. The Lerner Center galvanizes RBS’s partnership with the pharmaceutical industry and deepens its support by upholding these businesses as vital contributors to the state’s economy. At the same time, the center complements RBS’s pharmaceutical MBA program and enriches the educational experience of its students. The ultimate goal of the center is to position itself as a bastion of excellence in research and training in pharmaceutical management studies. The Annual Healthcare Symposium is a signature event for Rutgers Business School’s Lerner Center. It showcases the center’s role as a source of thought leadership for issues and changes in the pharmaceutical and healthcare industries. 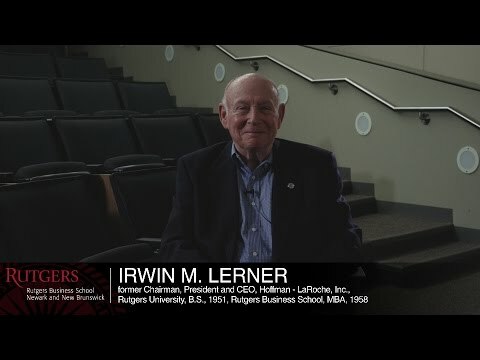 The event regularly draws an audience of MBA alumni, industry professionals, faculty, and current students, as well as members of the center’s board, including Irwin Lerner, former chief executive officer of drug maker Hoffmann-LaRoche and an alumnus of the Rutgers MBA program. The work of the Lerner Center also bolsters the strength of the MBA in Pharmaceutical Management at Rutgers.